Do you dare take from the forbidden tree? Click here to play! The Forbidden Fruit is but a touch away; adventure into this wondrous land to enjoy the spoils of a world long forgotten. 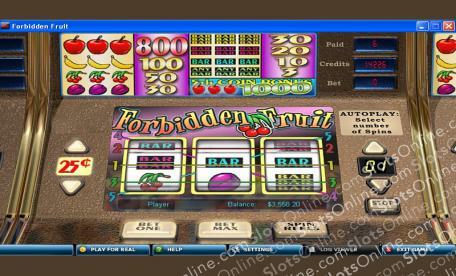 Forbidden Fruit is a fun 3-reel slot that is played across 5 unique pay lines. Open up more pay lines and you’ll be in line for more winning combination possibilities. There are no unnecessary Wilds, Scatters, or Bonus Rounds to distract you from the excitement of spinning up the best combos! Plums, cherries, bananas, and bars will all help you succeed with lucrative payouts, but if you are looking for the biggest win of all, then try your hand at spinning up the apples. Land all three on an active pay line and walk away with 800 exciting coins! The Forbidden Fruit is waiting for your hand, so start picking your way to success today!